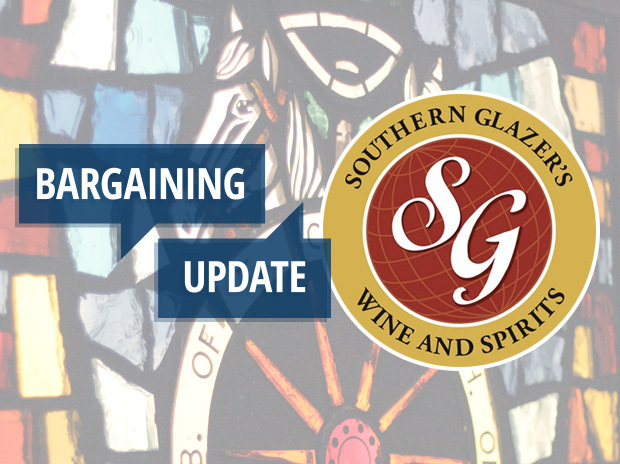 The Teamsters Local 710 Bargaining Committee for Southern Glazer’s Wine and Spirits (SGWS) met for the eighth round of bargaining today. Secretary-Treasurer Mike Cales joined negotiations and opened by explaining that the union’s committee met with the local’s counsel and representatives from Joint Council 25 and the International yesterday for serious conversations regarding the pace of negotiations, the overall passion from the committee, and what actions to take moving forward. Cales also presented a letter to the company to cancel the current extension agreement in ten days per the language in that agreement. There is a significant amount of dedication from this committee, and the entire bargaining unit has the full support of the union and their committee. We need to make meaningful forward progress and are looking to reach a fair agreement as soon as possible. When the company works any temporary driver more than 50% of the time in a given quarter, two new drivers will be hired. Four new drivers will be hired upon ratification of the agreement. When a driver declines a helper, incentives will be increased at all levels as laid out in the contract currently. The Union and the company are currently scheduling dates to resume bargaining for the next coming weeks.